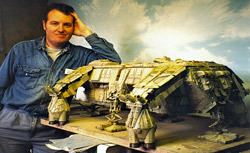 Martin Bower is one of the most highly prolific model makers and designers to the film, TV, advertising and publishing industry. Martin started off building models as a child inspired by his TV favorites. He is totally self-taught with no college or formal training. His first TV commission was building sign boards for a PG Tips chimps advert! 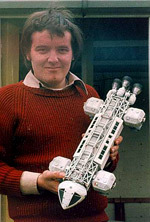 However, he eventually got a job building and designing models for the TV series Space 1999, thanks in part to the help of SFX Director Brian Johnson, to whom Martin freely admits to being indepted for giving him a very free hand, both in the designing and building of the 86 models he did for the show over a 3 year period. 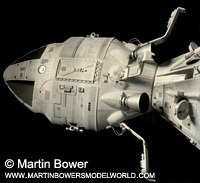 Martin also built models for a one-off TV show produced by the same team that did Space 1999. Into Infinity (aka The Day After Tomorrow) featured Space 1999 stars Nick Tate and Brian Blessed and gave Martin the opportunity to design and build all the models for the film. 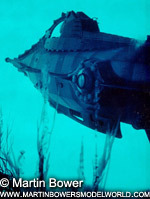 The Altares 'Lightship' featured in the film is still one of Martin's favourite designs. Martin went on to work on the TV series Blakes 7, (being responsible for the design of the now famous Teleport Bracelets) Dr Who, The Tomorrow People, Tomorrows World, Horizon, Tripods and many more. 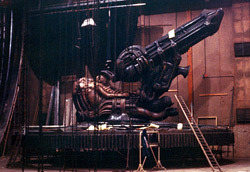 He was also Supervising Modelmaker on the 1979 feature film Alien, contributing designs to the film as well as models. He also held the same post on Flash Gordon and Outland, starring Sean Connery. 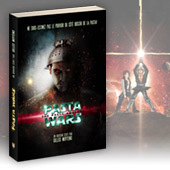 This interview has been conducted by Eric Chu (Designer on Battlestar Galactica) for The Scifi World. Eric Chu: Model building is widely thought of as a hobby, not something that is normally thought of as a typical professional vocation, and those who have found themselves in this field are a select few indeed. Is that distinction simply a matter of payment, or is there something more to it? What sets a professional model builder apart from a hobbyist? Martin Bower: Well, for me it was watching “SUPERCAR” and films like “THE FIRST MEN ON THE MOON” (Ray Harryhausen, who did the animation for that film and of course the Sinbad films, who I've very luckily got to know well over the past 26 years, was a real hero of mine) So at the age of around 8-10 years old. I found these films & TV programmes so inspiring, I just knew from then onwards, there was only one job for me & that was to be a Special Effects Modelmaker. Yet, my school teachers all did everything they could to put me off, but I was never swayed! And to date I’ve built 1046 models since going professional 41 years ago; I’d like to meet one of my teachers but they’d be long dead now! But also you ask what sets the professional apart? I think really it’s the ability to work without doing any proper drawing, and to work really fast! (which was certainly the case on my first major production “SPACE 1999”). In the episode “DRAGON’S DOMAIN I had to build 3 scales of the ULTRAPROBE, including a large model that had moving arms for the shot of the Command Module detaching from the Space Station where the “Dragon” resided, and 4 derelict ships, all in 4 weeks! Eric Chu: Do you make a distinction between those who are kit builders and scratch-builders? What are the challenges a scratch builder faces that a kit builder does not? Martin Bower: Well mainly the ability to use many other materials. For example being able to carve wooden shapes accurately is a must. Almost all the THUNDERBIRD models and other craft like the “ENTERPRISE “E” from “Star Trek”, “The NAUTILUS” from “20,000 LEAGUES UNDER THE SEA” and any other shape involving compound curved shapes (that’s when a curve is going in 2 directions at once) were carved in the rubber tree wood Jelutong, with moulds being taken off these masters to produce fibreglass castings that were light but strong. Eric Chu: Do you consider modellers artists or craftsmen? Where is the line that separates the two? Martin Bower: Well it depends on what you mean by modellers. To me model makers are artists in my line of work. But if you build model buildings for say, office developments, then that is not art, it’s craft. But SFX modelling involves being an artist as well as a model maker. Eric Chu: What are the biggest misconceptions that Hollywood, or people in general, have about miniature building? Martin Bower: I don’t know that they have any misconceptions. They know models are expensive, but nothing like as expensive as doing it CGI! Eric Chu: What are the specific challenges one has to consider when creating a model for film work as opposed to a display piece? Martin Bower: Well film & TV models need to strong! They get knocked about quite a bit & when we have jet charges put into models to create, say, Thunderbird 2 landing, the model has to have flame-proofing around that area. Otherwise really there is no difference. I mean many models I’ve made for TV or film have ended up as display models in either exhibitions or museums. Eric Chu: What is the biggest limitation of using miniatures? And what do miniatures do better than any other technique? Martin Bower: I don’t know that there are any limitations, I mean all models can be filmed in almost any way. See the first original “STAR WARS” as an example. That was all done with actual models originally. Also models look as if they are actually there, if you see what I mean. Some CGI effects look more kind of cartoon-ish, if indeed there is such a word. Certainly I’ve never seen CGI produce smoke or dust being blown up say on a spacecraft landing on a planet. It always looks odd in CGI. Eric Chu: What technological advances do we have now that have dramatically change the face of miniature work since the early days? Would you have made any of your models differently now? 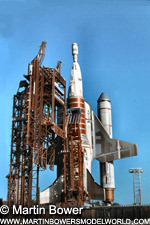 Martin Bower: No, but without a doubt Computer Generated Imagery (CGI) has put a great many model makers out of business. 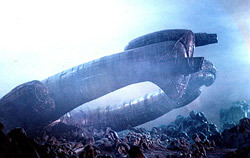 Indeed the latest in the line of ALIEN films (Prometheus) is not using models on it at all, & I think that’s a real shame. As far as I’m concerned I’ve still never seen a CGI shot that looked so realistic you could not tell it from a three dimensional model. Somehow CGI always looks “fake”. I mean take “STAR TREK: VOYAGER” for example. In the scenes where its legs deploy and it lands on a planet it almost looks like a PIXAR animation, especially the smoke & dust, they really can’t get that right! Eric Chu: Going back in time, was building models always more than a hobby? What had you planned on doing after school? 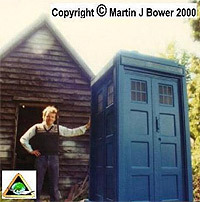 Martin Bower: I knew, as I’ve already said , that I wanted to be a Special Effects model maker from about the age of 8. I was a total failure at school & thoroughly hated it! Nobody really encouraged me, except my mum & her father (my grandpa) They were always very supportive. But sadly my dad was a city financier & never really knew where I was coming from. I remember the first day my models came on TV, he was too busy to even come & see them & I was always sad about that. He died 3 years ago & I think at the end he had finally realised that what I did was “a proper job”! Eric Chu: Do you prefer working solo? or as a team on bigger projects? Martin Bower: I tend to prefer working alone. I work faster that way as there are no distractions. Sometimes of course you need help on certain large jobs, and also if you’re working on a film in the studios, as opposed to building the models outside & then delivering them, you work as a team. The only bad experience of that is that some people in the film industry take against you if you’re younger than they are & are Supervising Model Maker. Also certain people don’t like you just because you make models better than they do. Eric Chu: Do you prefer working from very specific plans, or a rough sketch? Martin Bower: Rough sketches every time, or sometimes no plans at all. I have a very vivid mental picture in my mind of what I want to see & am able to work towards it without the use of any plans. This was certainly the case with “Space 1999” as I think I’ve said, there was barely time to think on that show, let alone do drawings! Eric Chu: How are the old models holding up these days? I've heard horror stories about old miniatures languishing in studio storerooms rotting away. Do you now take endurance into consideration when you take on a contract? Have you been able to rescue any from the scrapheap? Martin Bower: Studios & certain people (who I’ll leave you to guess at) throw the models away and/or have them burnt! I think this is a CRIME! One very well-known producer had all the models, sets & puppets burnt when the studios closed down! A few people grabbed what they could, but most were lost for ever. TERRIBLE! I managed to get the OUTLAND Shuttle & The original large “Liberator” from “Blake’s 7” back & restore them, but I sold them at auction in London a few years ago with the money going to charity. The “Outland” model weighed 60 lbs! Eric Chu: You, as well as model work in general, seem to have a tremendous following in Japan, where miniatures are often favoured and adored much more than in the Western world. Do you find that it is a cultural difference, or is model work pretty much loved universally? Martin Bower: I must admit the fans in Japan are great at having replicas made of their favourite craft if that is anything to go by. Indeed, I have seldom made models for collectors in the UK as it seems there just isn’t the money here. Also the Japanese & indeed the Americans & Canadians seem to realise that these models do not come cheap, as it’s the hours they take to build the determines much of the price, but certainly I have done more collectors jobs for people in Japan than for any other country. Eric Chu: In terms of personal projects, what’s the longest time you’ve ever spent on a model? Martin Bower: The models I built for my own TV project “STARGUARD have kept me busy on & off over the years, but the model that took the longest time was the USS ENTERPRISE “E” model. It was just over 5 feet long & took almost 4 months to build. 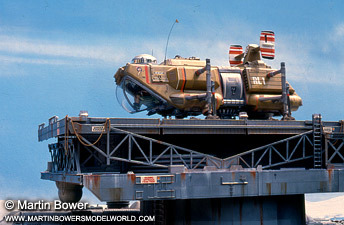 It had 3 different lighting systems in it which had to be run on 3 different voltages, this of course is excluding models like the NOSTROMO for “ALIEN” which was a team effort anyway, but with it initially being painted yellow & filmed like that, only to then be changed by Ridley Scott, (the Director) when he came over to Bray studios where we in the model unit were based & had the models changed & then re-shot all the SFX miniatures again, made the NOSTROMO & REFINERY probably the longest models taken to build in terms of time actually spent on a single model. We worked out at the time that the NOSTROMO would have cost £88,000! A huge amount today, never mind back in 1977. Eric Chu: In terms of professional work, what was the most enjoyable project you’ve ever worked on and why? Martin Bower: Well that has to be “SPACE 1999”. Obviously I spent a lot of time on my “STARGUARD” project, but that was me making models for my own film. But “Space 1999” was great because never before (or since!) have I had so much control over the way the models were designed, I had almost total control over the designs of all the ships I built, & I owe that to Brian Johnson who saw I could do these models & allowed me that freedom. Eric Chu: In terms of design work, what are some of your favorite designs and/or designers? What really grabs you? What do you look for in a successful design? What makes for an unsuccessful design? Martin Bower: Well that’s really 4 separate questions! If I could only take one to my desert island it would have to be SUPERCAR, the show that started me on the road to doing what I do. As I’ve explained. Reg Hill’s design was, & still is truly wonderful. I just cannot work out why nobody, with the exception of the “BUDGIE” model bought out in the 1960’s, has ever got the shape, or colours of that craft right! I also love Harper Goff’s “NAUTILUS” from the Disney's “20,000 LEAGUES UNDER THE SEA”& Ray Harryhausen’s design for “CAVOR'S SPHERE” in “THE FIRST MEN ON THE MOON”. As designers go, I think for the sheer number of good designs, it would be difficult to beat Derek Meddings & Mike Trim, who together designed all the craft from the puppet shows from “Thunderbirds” & the shows that followed. As to what makes a successful design, well we all have our favourites, but I tend to prefer (as is indicated by me choosing SUPERCAR) craft that are sleek & are not too cluttered. A bad design is where someone gets a basic shape & with no thought about what a certain thing does; just sticks kit parts all over a model, the end result is just a mess! It’s fine to use kit parts to detail models, we all do it, but you must give thought to what that piece of detail looks like & what its function is. Also it’s important to leave areas clear on heavily kit-bashed models as panel lines & good weathering can make or break a model. Eric Chu: What is the skill set that a “modeller” should work on developing? What’s the most important technique that you ever learned from someone else? Martin Bower: I think being able to carve 3D shapes in wood is very useful. I wasn’t taught anything, I just sort of picked it up along the way. But I guess being able to use a Lathe is VERY important! Eric Chu: Recently there has been news of SPACE: 2099 going forward by ITV. However there is another such project that has existed online for years and your attachment to Eric Bernard's proposed production is an exciting prospect. Would this mean a full return to using miniatures? Or a combination of practical and digital effects work? Have you been approached to participate in Jace Hall's production? Martin Bower: I’ve not heard of Jace Hall & was not aware of another project other than Eric Bernard’s “SPACE 2099” I’m pretty certain we will be using miniatures, but with certain effects added on in CGI. It’s all a bit early yet. Eric Chu: How do you feel about ITV's plans to remake or re-imagine the story? Do you feel there are ways to significantly improve the original series, or is it better left well enough alone? Martin Bower: I think they have to move the story on. I mean, the new series (if indeed it goes to a series) is happening nearly one hundred years in the future! You only need to look back at the last 10 years to see the huge advantages there has been in mobiles (cell) phone technology to see how rapidly things are changing. Eric Chu: Do you have a dream project? Martin Bower: Yes. STARGUARD. I originally wrote the synopsis in 1986, but since “STARGATE SG-1” came out I’ll have to change it quite a bit, as there are rather too many similarities! Eric Chu: And finally, will we continue to see Bowerhouse magazine? Martin Bower: Yes, but the next issue will be an e-magazine!